We’d love your help. Let us know what’s wrong with this preview of Ramen by Ryland Peters & Small. 'Ramen' is the Japanese term for any noodle soup. 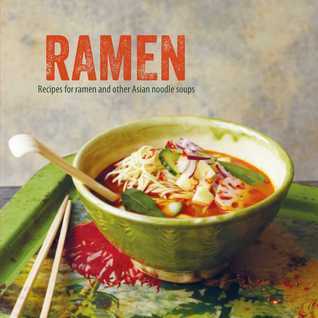 Organized in this collection of recipes for ramen, pho, udon, laksa, mohinga, and tom yum by main ingredient: Vegetables, Fish and Seafood, and Meat and Poultry. A helpful glossary of noodles, Asian ingredients and terms will help you get to grips with everything you need to know before embarking on the recipes for silky sm 'Ramen' is the Japanese term for any noodle soup. Organized in this collection of recipes for ramen, pho, udon, laksa, mohinga, and tom yum by main ingredient: Vegetables, Fish and Seafood, and Meat and Poultry. A helpful glossary of noodles, Asian ingredients and terms will help you get to grips with everything you need to know before embarking on the recipes for silky smooth, fragrant noodle soups. Typically there are four types of base broth for ramen: 'shio' (salt), 'shoyu' (soy), 'tonkotsu' (pork), and miso, as well as a host of other styles from around Asia, including Vietnamese pho, Japanese udon, Malay laksa, Burmese mohinga, Cambodian num banh chok, and Thai tom yum. To ask other readers questions about Ramen, please sign up.